Neo-Nazi rallies and PR activities in Sweden, including putting up stickers, have rocketed by 20 percent in the last three years, reaching record heights, despite a decline in the number of far-right organizations, the anti-racist Expo Foundation says. “It's an enormous increase. Just in a couple of years, in three years' time, it has almost doubled. We have never seen this many activities before,” Anna-Sofia Quensel, Expo investigator, told Swedish Radio on Tuesday, The Local reported. In the last year, the number of neo-Nazi activities has risen by 23 percent, from 2,334 in 2013 to 2,864 or seven to eight a day. This comes as the number of neo-Nazi organizations in Sweden has declined in recent years. 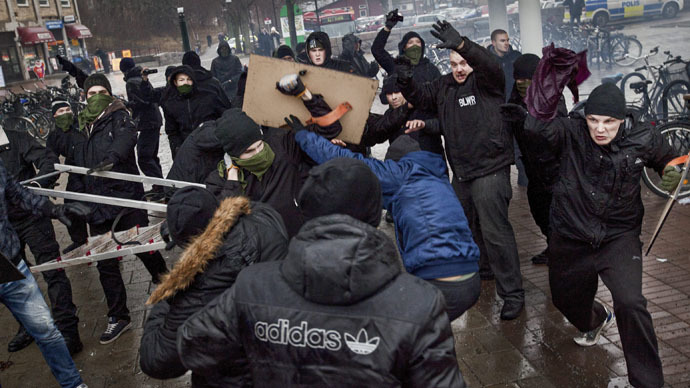 The official also noted that the activity of the neo-Nazi movements rose especially in the north of the country with the capital, Stockholm, topping the list. Among the neo-Nazi organizations, the Expo foundation names the National Democrats, the Swedish Resistance Movement and the Party of the Swedes as the main groups today. The parliamentary general election in Sweden last September was something of a shock to the nation, as the far-right Sweden Democrats party managed to garner the third-highest number of votes after running a virulent anti-immigration campaign. The Sweden Democrats strictly oppose immigration and integration, believing those policies failed and the Swedish people should not have to bear the burden of what they see as a reckless immigration policy. Last August, seven people suffered injuries after riot police clashed with anti-fascists at a neo-Nazi rally in Stockholm. Police reported four law enforcement officers needed treatment, along with three civilians. The rally was organized by the Party of Swedes. The Expo Foundation is a private research foundation established in 1995 with the aim of studying anti-democratic, right-wing extremist and racist tendencies in society. The Expo platform safeguards democracy and freedom of speech against racist, right-wing extremist, anti-Semitic and totalitarian tendencies throughout society. It is not connected to any specific parties or political groups, but cooperates with everyone who shares the foundation's point of view.